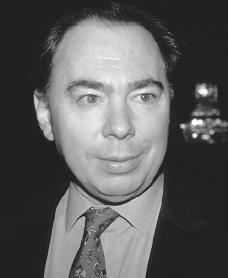 Andrew Lloyd Webber was born on March 22, 1948, in London, England. His father, William, was the director of the London College of Music, his mother, Joan Hermione, was a piano teacher, and his younger brother, Julian, is a cellist. Thus, Lloyd Webber came by his musical ability naturally. Young Lloyd played the piano, the violin, and the French horn. Excerpts from his first musical composition, The Toy Theatre, were published in a British music magazine. As a child, Lloyd Webber dreamed of becoming Britain's chief inspector of ancient monuments. He won a Challenge Scholarship to Westminster and in 1965 entered Oxford University as a history major. In the 1980s, after a long and successful career in music, he exercised his love for history through Sydmonton Court, his country estate, whose oldest section dates from the sixteenth century and where his compositions were tried out at yearly festivals. Other childhood pastimes of Lloyd Webber's surface in his works and his approach to their staging. His keen ability to envision fully-mounted productions of even his most spectacular pieces may have stemmed, at least in part, from his experience as an eleven year old working with his elaborate toy theater, built to scale. Lloyd Webber's lifelong fascination with trains was exhibited in Starlight Express (1984). Some consider this his childhood fantasy gone wrong, a warped interpretation of the famous story of the little engine that could. Lloyd Webber's formal education ended after only one term at Oxford. He left to begin work on the never-to-be-produced musical The Likes of Us, which is based on the life of British Dr. Bernardo, a well-known philanthropist, or one who raises money for charities. Lloyd Webber's career was closely linked with that of lyricist (writer of songs) Tim Rice, and their partnership began with this musical. The duo's next effort was Joseph and the Amazing Technicolor Dreamcoat (1968, extended 1972), at first a concert piece, then expanded into a two-act production. The score demonstrates what were to become the Lloyd Webber trademarks of shifting time signatures and styles, ranging from French cafe music to calypso (a musical style originating from the West Indies), country, jazz, and rock. In Jesus Christ Superstar (1971), popular music was presented in classical operatic form. Developed first as a demonstration disc for Decca Records, it began the Lloyd Webber-Rice tradition of recording first, then producing. The score boasts the hit single "I Don't Know How To Love Him." Tom O'Horgan, who gained fame by directing Hair, directed the 1971 version at Broadway. When Rice became irritated with a proposed musical based on the works of writer P. G. Wodehouse (1881–1975), Lloyd Webber teamed up with British playwright Alan Ayckbourn on the unsuccessful Jeeves (1974). During this period, Lloyd Webber also composed the film scores for Gumshoe (1971) and The Odessa File (1973). Again, Lloyd Webber and Rice were paired for Evita (1976), the story of the actress who married Argentinean dictator Juan Peron (1895–1975). Veteran Broadway producer Harold Prince was hired to direct the 1978 and 1979 productions on both sides of the Atlantic. Evita faced the criticisms that have consistently plagued Lloyd Webber's compositions. He was accused of "borrowing" songs and his work was called "derivative," "synthetic," and a "pastiche," or imitation of others. Lloyd Webber's next production, Song and Dance (1982), was the result of combining two of his earlier pieces: Variations (1978) and Tell Me on a Sunday (1979). Variations (1978) is a set of cello variations written for his brother, Julian, and Tell Me on a Sunday (1979) is the story of an English working girl who moves to New York City and goes through a series of relationships. Cats (1981) marked the composer's personal and professional breakthrough. Based on T. S. Eliot's (1888–1965) volume of children's verses, Old Possum's Book of Practical Cats, the production was staged by Royal Shakespeare director Trevor Nunn and its extravagant scenery was created by John Napier. Rice was called in to provide assistance on the lyrics for the now-famous "Memory," but his words were abandoned in favor of Nunn's. Lloyd Webber found himself attracted at first vocally, then romantically, to performer Sarah Brightman. She was a castmember in Cats, and in 1983 he abandoned his first wife, Sarah Hugill, for her. He later married Brightman and she was cast as the female lead, Christine Daae, in The Phantom of the Opera. With Cats, putting on an enormous display became the key to success both in London and on Broadway. It was only natural that a production like Starlight Express would follow on its heels. Lloyd Webber and Prince were paired again for the romantic 1986 production of Phantom of the Opera. Lloyd Webber's production Aspects of Love (1989) was in many ways a "retread." The score is filled with tunes retrieved from Lloyd Webber's past, reworked for the occasion. In the 1980s Lloyd Webber turned his attention toward his production company, Really Useful Theatre Group, Inc. In April 1990 he announced his intention to take a leave from writing musicals and to turn to moviemaking, perhaps even a film version of Cats with Stephen Spielberg (1947–). In July 1990 Lloyd Webber announced his impending divorce from Sarah Brightman while she was completing her summer concert tour of The Music of Andrew Lloyd Webber. However, the couple planned to continue working together after their divorce, despite Lloyd Webber's early marriage in London to Madeleine Gurdon. Lloyd Webber went on to produce Sunset Boulevard, in London, 1993, and in Los Angeles and on Broadway, both in 1994. Besides The Likes of Us (lyrics by Rice), his other unproduced plays include Come Back Richard, Your Country Needs You (with Rice), and Cricket. In 2000 Lloyd Webber bought Stoll Moss, one of Britain's top theater companies, for about 85 million pounds ($139.4 million), which made him one of London's biggest theater owners. Citron, Stephen. Sondheim and Lloyd-Webber: The New Musical. New York: Oxford University Press, 2001. McKnight, Gerald. Andrew Lloyd Webber. New York: St. Martin's Press, 1984. Walsh, Michael. Andrew Lloyd Webber: His Life and Works: A Critical Biography. New York: Abrams, 1997.